Blowing hot air: glass artists in Dorset - in pictures. Notarianni Glass is opening its doors to the public for the biannual Dorset Arts Weeks 2018. Gathering from the furnace. Photograph by Matt Austin for The Arts development Company. Looking for a unique gift, something magical, a bit different, creative? Notarianni Glass is offering a range of glass courses, that might fit the bill. From individual glass blowing days (both half and full days) to a 6 week courses offering a deeper understanding of the material. 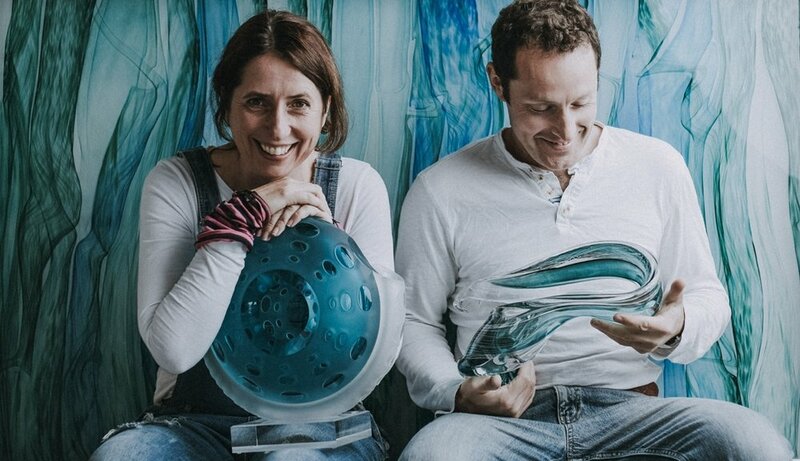 Amanda will also be running a sand casting workshop in 2018 and Charlie will be running a hot glass sculpting workshop leading up to Dorset Arts Week. All courses offer the opportunity to make, finish and keep pieces of work. For further information or to sign up for a course please click box below to take you straight to the relevant page. Alternatively if you have any questions you can email charlie@notarianniglass.co.uk directly. Amanda Notarianni and Charlie Macpherson. Photograph by Matt Austin for the Arts Development Company. We warmly wish to invite you to join us in celebrating Christmas! We'd be delighted if you'd join us for a festive evening of mulled wine and mince pies whilst enjoying a glass-blowing demonstration and viewing a selection of our bespoke glass sculptures. This will be our opportunity to introduce ourselves and our work whilst offering a rare glimpse into the wonderful art of glass-blowing and a perfect opportunity to purchase a unique gift for Christmas! We look forward to welcoming you for what we hope will be a wonderful evening of creative insight and festive cheer! Fifty Dorset Makers - A BOOK + SUPPORTING EXHIBITION. Examples of Dorset’s finest designer makers working in ceramics, glass, paper, stone, textiles, wood, minerals, and metals. Work for sale and by commission. Making Dorset is the new, long term initiative of DVA, producers of Dorset Art Weeks Evolver magazine, the south west’s pre-eminent arts magazine, is celebrating its 100th edition Wolfeton Riding House is a spectacular, historically important building recently saved by the WRH Trust with major support from the Heritage Lottery Foundation. Visit Making Dorset for more information. Amanda and Charlie will be introducing you to various techniques and making processes. These include learning how the manipulate glass, to shape and blow before adding colour, as well as learning how to etch, carve and polish the glass to achieve exquisite pieces for you to keep. HRH, Prince Charles, paid a special visit to Notarianni Glass in May, whilst he was at the Dorset Centre for the Creative Arts. We have officially moved into the new studio at the Dorset Centre for the Creative Arts. This exciting move comes after we decided to relocate to Dorchester in order to set up a practice that would enable us to focus on the scale and sculptural aspect of our work.